I had thought that the scariest sight that weekend would be the images of the “Unite the Right” rally. Men can be scary enough on their own. Men with violent ideologies are simply terrifying. The white supremacist rally was toxically masculine, looked utterly fascist and sounded like a historical period that should never be repeated. The Nazi and KKK symbology, the light from their absurd Tiki torches, the Confederate flags, the rampant anti-Semitism, the collared shirts that made them look almost respectable, the chants of “Blood and Soil”, the Swastikas. Even following it online was too much. The white supremacist rally on August 12 felt too evil to be real, yet it wasn’t quite surprising or something out of the blue. But then that car ran into the protesters, and it was worse than we could ever imagine. 19 people were injured and one was killed in a deliberate attack by a fascist extremist. “Just stay safe please,” I irrationally felt compelled to text someone I care about simply because 1) he happened to be – although a hundred miles away from the action — in the same state at the time of the chaos, and 2) because he had gotten his life threatened by white racists in Virginia years ago in Obama’s supposedly post-racial America. Julia Damphouse (BA3) texted a group chat saying that she knew some of the DSA (Democratic Socialists of America) members who were in Charlottesville. I asked her if she knew anyone who was hurt. She said she didn’t. That didn’t make it better. I started thinking: “What if a car had run us over in Skopje? They ended up trying to kill our opposition — what would’ve stopped them from extending that violence to the non-politicians opposing the government?” I couldn’t help but compare world politics to my country-specific lived experiences. I felt a solidarisch sort of fear that day. 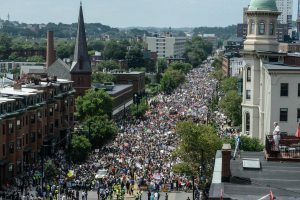 But this fear – of ideology, of violence, of dying – didn’t stop thousands of people in the US, in especially high numbers in Boston, and elsewhere from potentially putting their bodies on the line to march and rally against hate and fascism. 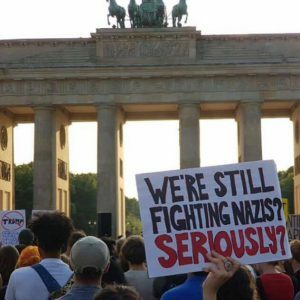 Berlin, a place that knows of Nazis all too well, had a rally, too. 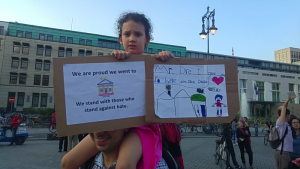 Organized by The Coalition Berlin, about 600 of us stood in solidarity with Charlottesville. It was an exceptionally sunny day for such an event that it was almost inappropriate. People came with well-thought-out signs reading “Heather Rest in Power”, “Pick a Side”, “Fascism is not to be Debated, but Smashed” and “White Supremacy is Terrorism”. The protest, I would say, was intersectional. The situation certainly demanded it. It wasn’t just a rally against Trump. It was a rally that welcomed refugees, supported queer people, and clearly said “Black Lives Matter”. “Nazi scum, go away, from Berlin to USA!” We chanted with fury. The diverse group at the protest that consisted of mostly immigrant protesters also included BCB students and professors. I came with Nathan French (BA4), Lisa Vogel (BA4) and Julia Damphause (BA3), but we also saw fellow students who happened to be in Berlin before the start of the school year. We ran into Kerry Bystrom and her daughter and Michael Weinman, who came with his whole family. Deandre Harris was Michael’s children’s school teacher while they lived in Charlottesville. Mr. Harris is the black man who got badly beaten with metal rods by white supremacists in Charlottesville that same weekend – the video is, honestly, difficult to watch. Michael’s children had signs wishing Mr. Harris a speedy recovery. It seemed that politics entered their lives much earlier than it did mine. In a sense they were forced into activism. Michael’s six-year old daughter, Rona, held a sign that read “I love you Mr. Dre, I hope you’re okay”[*1]. “Donald Trump made things worse, but I hope it’s going to be better.” [*2] said Michael’s 9-year-old son Ido. Even when faced with such political horrors in their lives and their classrooms, both of them seemed to hold on to the hope that the horrors will not last and that things will get better. As heart-breaking as it is to see children worrying about the world, stripped of the luxury of being politically neutral, I still couldn’t help but admire their actions. Sadly, the world needs their commitment. Running into so many of my peers and mentors who were openly standing on the right side of this issue made me proud of the institution that I study at. More than that, seeing them at this protest made me think about the role academia, academics and students play in activism and in shaping the political discourse, especially in times of severe political and moral turmoil. Ever since the morning of Trump’s election, the term “liberal bubble” has been thrown around a lot. Many students played with the idea that universities were these places that didn’t reflect and were shielded from the real world. To an extent, this is correct. Certainly, more people at universities hold liberal/left values. But what this phrase/idea neglects to acknowledge is that a student’s existence is not confined to their university: Their political reality extends beyond the classroom. To a certain degree, I can understand wanting to engage with “the other side”. There is the hope that you may change someone’s mind, and I would love it if a conversation was truly this powerful. The problem with wanting more “political diversity” on campuses, though, is the kind of “diverse” opinions that would be tolerated there. Would they be racist ones? Homophobic ones? Misogynistic ones? I would hope not. Our lives would be much easier if we truly existed in a “liberal bubble”, but this is simply not the case for the majority of people. Students of color face danger by simply existing in public spaces in an ever increasing right-wing dominated political landscape, refugee students have to look at those atrocious AfD posters [*3], queer students may have homophobic families, and women experience enough sexism in the world as it is. At a university, students should be guaranteed basic safety — both physical and emotional — and a learning environment in which they can thrive. When entering a classroom or walking on campus, I would personally love it if I could avoid an elementary conversation about why feminism is not actually anti-men or why gay people should have rights. I have enough of these conversations outside of BCB, and I am sure I’m not the only one. When at an academic institution, I want to dig deeper into these problems. Instead of spending class time defending the humanity of marginalized groups to educated people, I want to be a part of a more complex discussion that analyzes, identifies and hopefully finds ways to dismantle systems of oppression. “I don’t like black coffee” is an opinion. “I don’t like black people” is racism. At an academic institution, one of these should not be acceptable. Principle of refusal: escape the imposed debates, refuse to recognize the validity of certain ideologues as counterparts and of certain problems as relevant. These themes make the confrontation of ideas impossible; their removal is the condition of the debate [*6]. In other words, the only way that we could have a real democratic debate is if we remove these dangerous ideologies that we know bring about destruction like what was seen in Charlottesville. Only with principles such as those of the German laws — the banning of Nazi ideology and symbology — can a democracy truly flourish and a society progress. Certainly, this question of discourse in the public sphere and education is not new or exclusive to our current political landscape. 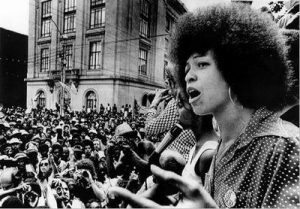 In her legendary lecture on October 8, 1969, after being fired by the Regents of California from her job as a professor at UCLA for being a member of the Communist Party, the iconic Angela Davis – activist, scholar, and one of the most famous political prisoners in history – delivered brilliant arguments about what education should really be about. “I maintain that political opinions should be brought into the classroom, they belong in the classroom. Education itself is inherently political. It should create human beings who possess a genuine concern for their fellow human beings,” [*7] she claims as she rejects the idea that education should somehow be apolitical. She explains that, in fact, education is much more covertly political than a professor like her overtly sharing communist ideas and gives concrete examples of this systematized politicization. It is precisely politics that gets universities research grants that are directly related to defense spending i.e. money that helps further support US wars like the Vietnam war. It is precisely politics that keeps students of color out of educational institutions through biased entry requirements and lack of adequate academic programs available in high schools with majority black and brown students. It is precisely politics that has put into place Band-Aid Affirmative Action type solutions instead of trying to solve the problem of systemic racism on an institutional level. Indeed, Angela Davis has a very specific idea of what education should be about, and that is dissent. I truly believe that the lecture that Davis gave 48 years ago is still relevant today and will continue to be so for the foreseeable future. Education should be about finding ways to better our society, not a way to give destructive ideologies a platform. Academic institutions must not only challenge prevailing political regimes when they need to be challenged, but they must also advocate for values of anti-racism, class consciousness and gender equality. In particularly troubled times such as these, as well as in times less demanding of dissent, academia needs to stand up for the truth and for the betterment of our world. Yes, we can try to understand the logical mechanisms behind certain right-wing ideas, particularly fascist/white supremacist ones, and assert why they are harmful. But we must not accept them as simply another point of view that can enter our (academic) discourse. It is we who should be helping to shape the discourse that can give rise to a more tolerant and inclusive society rather than giving racist and violent ideologies a seat at the table. Instead, we, students and academics, should be at the forefront of the promotion of values of respect and human dignity. And perhaps our knowledge can transcend the classroom and enter the streets in order to transform our political reality. Perhaps we can put our bodies at the forefronts of protests and rallies, thus helping set the stage for the eradication of human misery, suffering and racism, and in the process create “a society that reflects the interests of the people who constitute that society” [*9]. Garaev, Polina. While white nationalism erupts in the US, Germans protest racism and hatred. I24 News. 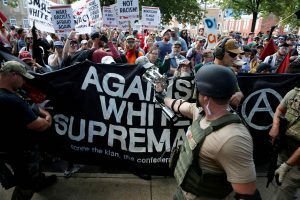 August 17, 2017. https://www.i24news.tv/en/news/international/europe/153174-170817-while-white-nationalism-erupts-in-the-us-germans-protest-racism-and-hatred.